20 comments 2.5 7,294 views 13 years ago in Misc. That's awesome. Man, this is a pet peeve of mine. I almost went postal when I saw a sign on the wall in a restaurant that read, "Ham and Egg's"
You're putting up a sign for the public to read, for Christ's sake - make sure it's correct. That seems so very long ago. why did they change that anyway? I thought it allowed you to change the capitalization of your screen name if you logged into quiztron...? And, of course you can access all the forums on quiztron, not just quizzes. 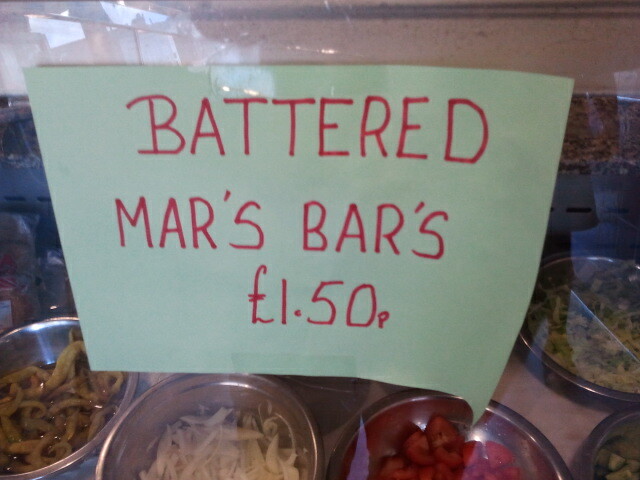 I'd like to take this opportunity to show you a photo I took at my local chip shop. Raaaaa! My god that pisses me off. OK, then how do y'all feel about using apostrophes after abbreviations to make them plural (which seems totally wrong to me). If you have more than on CD it should be CDs, not CD's. But look around, that's everywhere. I've always written CD's. Just looked it up, and apparently that's wrong. How did I even get here. I'm on boredville. My life has come to this.